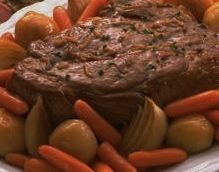 This is the time of the year when we are all looking for you can refer to as “Comfort Foods” This pot roast is definitely one of those nice, comforting and bearing a great aroma foods. To make the preparation totally painless – it is made in the slow cooker. And that mens that it pretty much cooks itself. Try it – I made it last night and it was great. And since we love mushrooms, I added them to the pot as well, but you could pretty much add any other vegetable as well. Enjoy! Lay potato, carrot and onion in bottom of 5 quart (5 L) slow cooker. Combine remaining 3 ingredients in small bowl. Cook on Low for 10 to 12 hours or on High for 5 or 6 hours. Hope you have enjoyed this recipe – please send in your comments, suggestions and experiences, your input is always welcomed and very much appreciated!